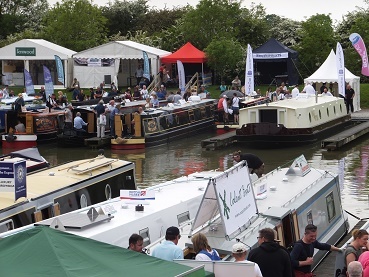 Crick Boat Show has become a social event for us over the years. We spend most of the first day just saying hello to people we haven’t seen for a while. This year we also wanted to check out various things for Oleanna, having a lot of companies in one place takes a lot of miles travelling out of the equation. Last year we approached Tyler Wilson to build and fit out Oleanna for us. They had recently started fitting out boats, using the skills of Louis and Ricky (son and son in law of Jonathan). On our last meeting in Sheffield we were informed that Louis and Ricky were taking over the fit-out side of things under the name of Finesse Boats. We had a choice whether Oleanna would be one of the last Tyler Wilson Boats or one of the first Finesse Boats. The only difference would be in the boat builder name as the same people would be working on it either way and in the same workshops etc. The contract we’d discussed with Julia would also remain the same. A newly formed collaboration of the finest boat builders in the industry. From paint to upholstery, steel to joinery, everything is contained on one site. Finesse were being launched at the show, so we went along to say hello and see if any progress had happened on our build. Ricky showed us a couple of photos of Oleanna in the paintshop. A photo can be seen on their facebook page. She was being sanded down after primer and undercoat. Next week they would start on the top coats. Once another boat is complete there will be room for Oleanna to move across and the fitout commence. During the show we popped back to see them, asking dimensions of a couple of things and pointed them in the direction of a few stands that were relevant to our build. There were actually three stands at the show with composting toilets. One was purely for the Airhead, another was Ecotoilets (who we spent most of last winter trying to get in touch with to no avail). So we went to chat with Patrick from Toilet Revolution. On his stand was a Sun-Mar which was very impressive as the whole composting process takes place in the toilet. It is just a shame that the unit is so huge, it even needs a step to enable you to sit on the throne. He was very informative and sent us a link for plastic urine tanks which we would need. Oleanna will be a 24volt boat and the Separett Villa only comes as 12 volt. So either we will need to step the voltage down to 12 volts or fit a 24 volt fan. Ricky popped along to see Patrick as he hasn’t fitted a composting toilet yet. Very handy to get both of them together and Ricky see the real thing. Michael at Sofa Bed Barn made us a sofa bed a couple of years ago for Lillyanne. We have been very happy with it, but sadly it won’t fit onto Oleanna as the layout is different. I had been in touch prior to the show to see if he would be able to make us a sofa that would also work as an occasional single bed with storage underneath. Last year on his stand he had a new model sofa ‘Dalton’. This is a two seat sofa which pulls out and has a pouffe that adds to the end and would give you a four foot bed across your boat. This year he had brought a new version without arms. We chatted through at length what he’d be able to do for us and it looks like we have a solution. The Dalton without arms can be made to different dimensions as can the pouffe. So we can have a 2.5 seater sofa with a 2 ft square pouffe that can be pushed out of the way most of the time, but is the right size to make the sofa into a single bed when needed. Heights of the storage box below could be altered if we wanted it deeper, as can the overall height of the back. Once the fit out of Oleanna is progessing I’ll be able to get accurate measurements for height and the finished length. Then a decision on upholstery, whether to match the dinette or be different? In the end we will have a bespoke sofa but based on a standard sofa, so hopefully not costing us an arm and leg. We saw four companies about covers. Wilsons of Kinver, Kinver Canopies, Titan Boat Canopies and Canvasman. The prices that we were given as estimates ranged from £2000 to nearly £3000 plus vat. Ideally we’d like Dark Blue Acrylic covers with windows, which are backed in a paler colour, so that when all closed up it is still light in there. Some people think that the acrylic goes green in time, where as PVC doesn’t. But as I’ve found a scrub with some techwash gets ride of it and the canvas look is one that we prefer. Our original plan was to have a pull out freezer under the dinette seating as our shareboat did. But height of the seat would be an issue for most freezers. The height we have to work with is around 1 ft. No-one at the show had one that low, even with the condensor at the back (Waeco) they are still too high. So we may need to rethink where it can go. Tuckey’s was there as they lift all the widebeams into the marina for the show. Mick had been introduced to Barry, so we went to chat with them about the price of transport and cranage to launch Oleanna at Crick. The harbour master has said that he would find us two moorings side by side for a couple of weeks so that we could move from one boat to the other with ease. Then once Lillyanne was empty and had a thorough clean we’d put her on the market, possibly with ABNB or Rugby Boats. Another option that we have is that Oleanna is launched in Sheffield, we move on board there and then move Lillyanne by water back south to sell. We could either do this ourselves or hire a boat mover to do it for us, this option is likely to be cheaper than Tuckey’s. There were some solar panels that received a good review in Waterways World a few months back. They are sold by Photonic Universe in Kent and they had a stall at the show. We will go for a 250 watt semi-flexible panel which seems to be the most powerful single semi-flexible panel available. We will have a 20 amp MPPT controler. This will enable us to fit another 250 watt panel if we find that one isn’t doing enough battery charging. We checked with the technical bod on the stall that a 20 amp controller can handle 500 watts at 24 volts. He confirmed that Mick’s technical training back in the 1970’s hadn’t been wasted and that W = V x I is still valid 40 years later! When the time comes to sell Lillyanne we obviously want the best price for her. We can try selling her privately with an advert on apollo duck or go through a brokerage. Whilst still in Crick after the show we paid ABNB a visit. Lillyanne was bought through ABNB two years ago and they offer a 10% discount to previous customers. Her details were still on the computer from when we purchased her, so a few adjustments to the things that we have done and a new value was worked out. This was a nice surprise as she is worth the same or even more than we paid for her two years ago. Their valuation would of course be dependant on an inspection. We’ll also be approaching Rugby Boats nearer the time to see what their brokerage fees are compared to ABNB. A busy show for us. Not many boats looked at, although we did have a walk through a 45ft boat for sale at £49,999.99. Everything was very basic inside and with no heating you would need to spend money straight away on it. This entry was posted in Uncategorized on 7th Jun 2016 by pipandmick.